Cars, video games and other high-tech gadgets are probably the first things that come to people’s minds when thinking of Japanese design. At second sight, Japan has a highly varied design scene that is influenced as much by its own history as, for example, it is by Bauhaus. Contemporary Japanese design is marked by a culture that equates elegance with simplicity of function and whose simple austerity has evolved from art and craft traditions spanning hundreds of years. The fusion of modernity and tradition, industrial production and handicraft as well as form and function make Japanese design famous and sought after all over the world. The clear and minimalist forms are also influenced by Western traditions and developments that go as far back as the Bauhaus movement. 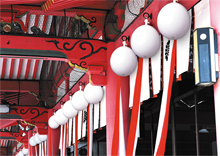 Japanese culture is characterized by its ability to merge its own tradition with modern influences. This same attribute is what shapes modern Japanese design, which developed in the 1950s, and the ideological background of which came from Masaru Katsumie, who was a follower of the Bauhaus movement. These developments quickly led to the foundation of design schools and institutions (METI, JIDPO, JIDA), while the island nation's economic growth subsequently fuelled the rapid development of industrial design. Apart from the European influences, American design also became increasingly important for Japan, in particular so in the automotive sector, where it was often accused of serious plagiarism. Outside the design industry, for example in architecture, graphic design, arts and craft, as well as fashion, Japanese designers were free to mix their own tradition with modern influences. Japan started to make a name for itself in the Western dominated fashion industry in the 70s. Its fashion at the time was clearly marked by tradition and Shintoism, whereby its simple style, appreciation of materials and natural fabrics brought new impulses to the fashion world. Today, the Japanese approach of blending traditional styles with Western influences is regarded as one of the most innovative trends in design. One of the most striking examples of this trend is Japanese pop culture. Some experts believe that adapting Japanese design may present a way of breaking out of the vicious cycle of self-referencing Retro styles for the West. "This exemplary collection represents a combination of the German and the Japanese tradition and stands not only for universal, but also fusional design, by virtue of which it sets new standards for stationery across the world. This is because the only kind of design capable of making a product accessible to virtually anybody has to be a design that arises from a fusion of a wide variety of foreign-origin elements. However, in our modern age of globalisation, our endeavour is not just about making universal products accessible, but we strive to enhance the quality of our time spent in offices, at desks, at home and on the road through our Düller collection." 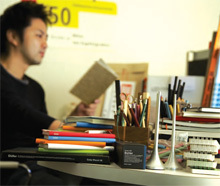 Kyouei Design The CV of Kouichi Okamoto, chief designer and founder of Kyouei Design, is just as curious as his designs. Okamoto is an entirely self-taught designer and never went to a design school. Metaphys In a consumer society, in which things are being produced in abundance, Metaphys wants to challenge basic principles to get to the core of things. Karimoku New Standard The history of Karimoku, one of the leading wooden furniture manufacturers of Japan, began in 1940. Shohei Kato founded the company in a small carpentry shop in Kariya, Aichi Prefecture. Isamu Noguchi Isamu Noguchi was born in Los Angeles, the illegitimate son of Yone Noguchi, a Japanese poet who had gained great acclaim in the United States, and Leonie Gilmour, an American writer who edited much of his work. Kouichi Okamoto One mustn’t always study design to be a great creator. Kouichi Okamoto was a DJ once and surprises as managing designer of Kyouei with unconventional living ideas today. Naoki Terada The Japanese architect and designer Naoki Terada was born in 1967 in Osaka. Since 2003 he leads his own studio "Teradadesign" in Tokyo, in which he realised designs in the area architecture, product- and interior design. Shin & Tomoko Azumi Shin und Tomoko Azumi gründeten 1995 das Azumi Design Studio in London. Dort betreuen die gebürtigen Japaner namhafte Kunden und wurden für ihre Arbeiten bereits mehrfach ausgezeichnet. Sori Yanagi Sori Yanagi was born in 1915 in Tokyo. His organic formed design connects western industrial design with the traditional hand made designs of Japan. Takashi Shinozaki Takashi Shinozaki was born in 1968 in Tokyo, Japan. From 1993 to 1996 he studied architecture at the Tokyo National University of Fine Arts. 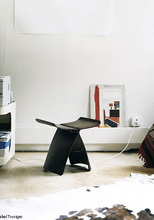 Takashi Shinozaki was already awarded twice with the Japanese Good Design Award. Tokujin Yoshioka Tokujin Yoshioka was born in the year 1967 in Japan. He concluded his studies at the Kuwasawa Design School in Tokyo in the year 1989. He combines handicraft tradition with the usage of contemporaneous material and innovative techniques in his works. Shigeru Ban Shigeru Ban is the most popular contemporary architect from Japan, who knows how to connect traditional Japanese design and architecture with ideas of the Western culture. Endless innovation and sensitivity can be found in his designs.